We as photographers love to be in that right place at the right time but of course it does not always pan out to our liking. Maybe you timed it wrong or had to do more climbing then you thought you needed to. Maybe there was not a trail or a clear path to get to that destination. One thing is certain nature is always there and you can return; it will be there waiting for you. I tried to summit this high peak last year in July and needless to say I did not summit on this trip but I did return three days later to try again. . . .
On the first trip up I was a little frustrated since I was not near the peak and just had to make the best of the situation. Along the way at the point where my sunrise destination had to be improvised, I encountered the first two scenes. The most prominent geological features were these turret like formations but the flowers surrounded by rock caught my eye the most. 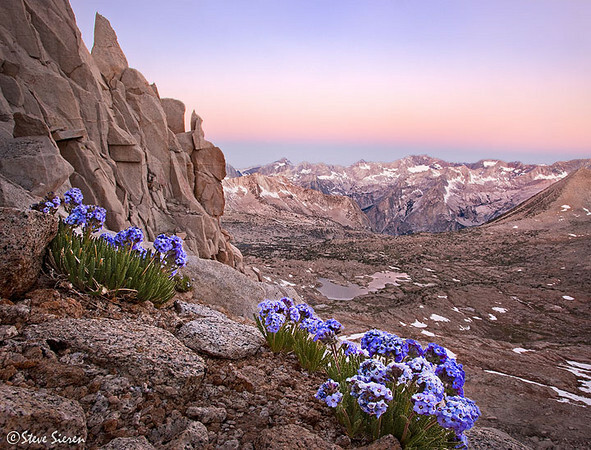 Nothing grows higher than a Sky Pilot in the Sierra Nevada. They grow right out of the scree slopes of Mt. Agassiz and stare at the Dusy Basin with LeConte Canyon off in the distance. The falling rocks just bounce off these little, dense, bush-like flowers only centimeters tall. I guess you can say we appreciate the smaller things in life. Sky Pilot is also a common name for a person leading others to heaven. I am not trying to say I am taking you there but it is as close as you can get on your own 2 legs in the mountains of California while still having flowers at your feet. 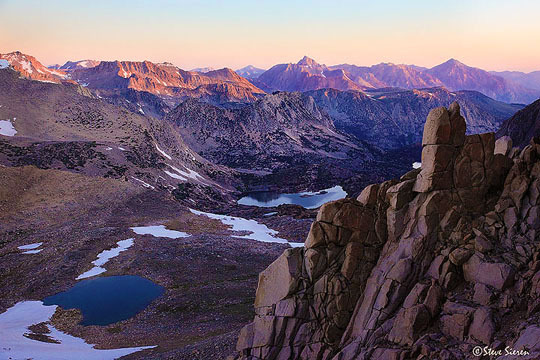 Here I am three days later trying to summit this mountain so I can shoot from the top at sunrise. At 10am this morning I was at home in Thousand Oaks and had this spur of the moment idea to try to bag this peak again. At 3:30 I am hiking to the top of Bishop Pass trail again. Shoot! The sun is going down and I am only at 13,000ft. I’m not going to make the rest of the 1,000ft scramble up to the summit in daylight and the moon will not be out to guide me either. I’m going for it! It’s dark and the temperature begins to drop. There is water running down the gulley I’m climbing and the patches of unmelted snow increase in size the higher I go. Occasionally I look down after each small section that requires climbing to see how much further I have gone. I make it to the top but I do not have a sleeping bag or a tent and there is still another 5 or 6 hours until sunrise. At this point the realization comes that this could be the stupidest thing I have ever chosen to do. I pull out hand warmer packages that skiers use for there hands, feet, and body and place them all over myself and attempt to sleep. It is 11pm or so and it is dark and cold out. I can see into Big Pine and some of the Owens Valley but I can also see into the San Joaquin Valley. My head lamp is off and there is no moon but I can still see the ground and talus surrounding me. Dust in the atmosphere reflects light from the sun back down into Earth’s night sky. I am still finding it hard to sleep without the comfort of a pad or bag but I am warm enough. A series of mulitple exposures at f4 20 seconds ISO 1600 in the early predawn light just to get myself warmed up compositionally before the actual sunlight shows up. After hours of falling in and out of sleep, dawn is finally here and clouds float above the Sierra Nevada’s largest glacier (it is Central California). I get up thinking what a rough night and imagine what if a storm might have passed while I was sleeping. 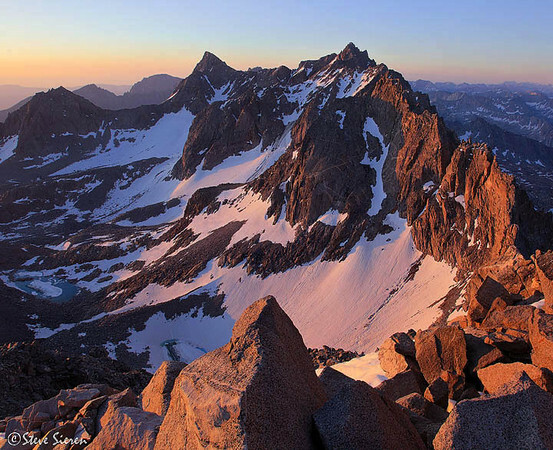 After photographing the pastels of dawn the light quickly changes and I feel the sunlight graze my head and face before I see it hit the sea of peaks in Sierra. All the clouds are gone like a normal summer day in the Sierra but I am happy as can be as I head down the mountain. Mt. 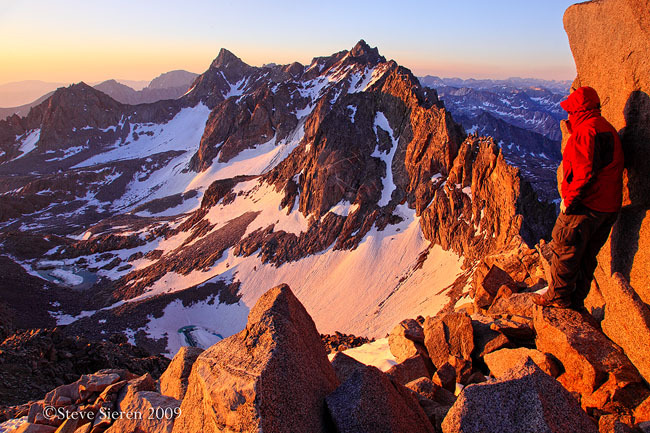 Agassiz is California’s 20th highest peak at 13,891 ft and is a bit more of a challenge then walking up to the top of Mt. Whitney. You do not need any kind of technical gear to summit so anyone can climb as long as you do not have any limiting physical conditions. Beware of falling rock and there is not a designated route to summit. It was a highly enjoyable experience but in the end it was not really about summiting and capturing that alpen glow dream shot. It was about stopping to smell the sky pilots and admiring all the other beautiful things along the journey. In life we take risks big and small that help us pass certain personal boundaries and this was one of my own personal boundaries. Could you imagine if John Muir worried about the tiny little things most of us worry about today? If so he might not have any stories to tell. This entry was posted on May 2, 2010 at 5:51 pm and is filed under Uncategorized. You can follow any responses to this entry through the RSS 2.0 feed. You can leave a response, or trackback from your own site. Steve… wonderful imagery and an even better narrative. Thanks for sharing what must have been an incredible personal and powerful experience. I can only imagine the scenes that your words and photographs so beautifully convey. The sunrise more than made up for an uncomfortable night. Nicely done! What a beautiful set of images. The sunrise image is very dramatic. David, Thank you, I can not say that I will ever forget the experience. That is extreme dedication! I remember seeing these on FM a while back. The third and fifth shots are absolutely fantastic! I can’t wait to get back into the mountains but I don’t think I’ll be sleeping on rocks while up there. Again, thumbs up on the dedication and the resulting photos! Excellent, excellent series, Steve. These are truly wonderful. Wow Steve, that is quite a story and well-told. Your images turned out very well. Between the memory, the photographs and the story you brought back, I imagine it was well-worth the journey. Beautiful shots that really capture the sweet light and moment! As a travel writer, however, I feel compelled to let you know of your misspelling in the title – sorry. I believe the word is “talus” vice “talous.” You do write beautifully! Steve, Thank you , thank you, thank you. Beautiful. Thank you all, I appreciate the comments! Karin, Thank you for catching that, I make quite a few of those errors often. Writing isn’t the easiest thing for me so I really appreciate the compliment. Your pictures here are just amazing and inspiring!! What a wonderful trip that must have been, wish i could have been there (except for the rough night) LOL 🙂 Keep up the great work !!! Thank you Epicswife it’s a site to see at sunrise. excellent writing Steve. Crazy story, I sure hope you let people know where you are going when go off on a whim like that. Just as fascinating to read the story as when first told to me. Very inspiring stuff! Dan, that would be nice to have. It’s another thing on the must have list. Part of backpacking is being innovative with what we have, and sometimes that means using the bare essentials. On this occasion, I used a rainfly, trekking poles, and a tripod. I love the composition of the skypilot shot. Looks like you had fun! Great shots — you sure earned them. After reading your story it shames me to no end to be the wimp that I am. Congratulations Steve, you are a wonderful photographer. You capture every amazing scenes of the world and you make people keep wondering. Thank you for always sharing these blessings, you never know who you made happy with your shots. Great story, amazing pictures, very special Steve! 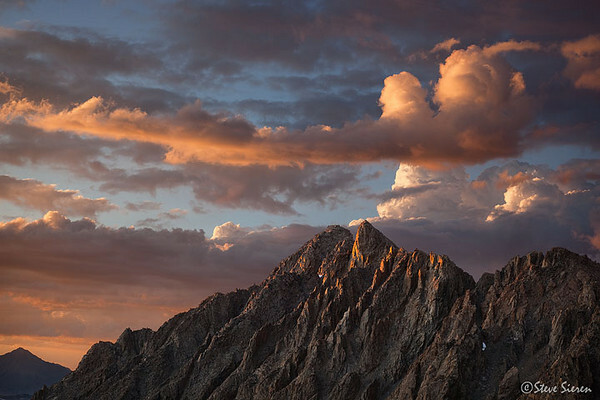 Few times I get soo inspired to plan a photo hiking trip. The pictures of Beto Santillan – Huayhuash – Peru forced me to go there. 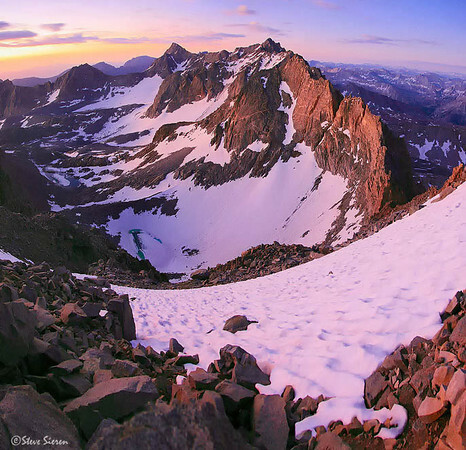 Now the Sierras pictures of Steve Sieren has set my plans for 2011. One of the hiking visits has to be Mt. Agazziz based on the AWESOME pix. i joust don’t know about all that snow and cold….. brrrr. But wonderful, just wonderful.